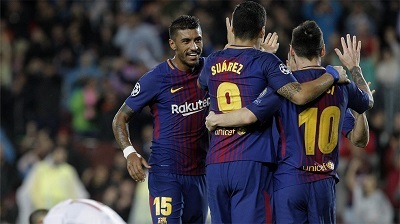 FC Barcelona continued their unbeaten start to the season with a 3-1 win over Olympiakos at the Camp Nou. Blaugrana took the lead in the 17th minute after Nikolaou redirected Duelefuo’s ball into an own goal. Four minutes from the break, Pique saw red for his second bookable offense when he handled the ball for a goal. Nonetheless, the Blaugrana continued to dictate tempo even though they were a man down. Messi scored the insurance goal in the 60th minute from a wonderful curving free kick. That goal was his 100th European goal and three minutes, Messi would set up Barça’s third and final goal courtesy of Digne. This result meant that Barça were group leaders with 9 points from three matches and now will shift their attention to last place Malaga on Saturday. Cautions: Piqué (10′ & 41′); Romao (3’0′), Nikolaou (59′), Elabdellaoui (90′). Previous PostBarça battle Atlético to a 1-1 draw. Next PostBarça remain league leaders after defeating Malaga 2-0.